The 2016 Summer Olympics are now in the past, but throughout the event, it was made clear who could and could not use the very protected Olympic brand and how permitted entities could use it. In fact, over the past two decades, the International Olympic Committee (IOC) has developed a growing list of guidelines for the use of its brand that has stretched beyond the name and iconic five-colored rings. For example, the IOC has added keywords and specific hashtags, such as #Rio2016 and #TeamUSA, to its list as well. If you were not a full sponsor this year, you were excluded from using any of these items during a specified time period before, during and after the event. Like the IOC, law firms need to own their brands. It’s part of running a law firm like a business, and if your law firm isn’t thinking this way, it should be. After all, your brand is your most valuable asset. Brand protection activities include trademarking logos, unique phrases or word structures when possible. Of course, your brand is more than your logo. It also includes your firm’s message, story, visual identity, colors and fonts. In its totality, your brand is a package of who you are and what you stand for. But – beyond legal protections - how do you “own” your brand, especially when it encompasses certain elements that just cannot be trademarked? The answer is that it requires consistency, authenticity, firm-wide involvement and effort. Every brand should be accompanied by a style guide. These are created by the agency that worked with you on developing your identity and messaging. It is the one go-to document that covers every aspect of your brand and how to use and implement it. It will show you the proper ways the logo should be used, what your verbal message is, as well as what visual images best convey who you are. Your firm’s brand guide often is a very large document. To streamline the information, a more compressed “cheat sheet” can be developed for distribution throughout the firm. Remember, everyone in your firm needs to be that brand ambassador. Using and telling your brand message both internally and externally requires consistency by each and every person. Your brand should be true to who you are and deliver on your brand promise. It is important that the people in charge of your brand (usually the marketing department) monitor its use and follow the principles from where the brand evolved, as outlined in your style guide. These are the go-to people for the rest of the firm to reach out to about your brand use. If your firm does not have a marketing department to handle questions about your law firm brand, then appoint a person (or small committee) to be in charge of managing your brand, or who can work with your outside agency to get the necessary answers. Make sure those who handle the firm’s social media accounts are well-informed and trained in the brand message, strategy and goals; this will help eliminate any confusion internally and externally. Every single person in your firm is an ambassador and has the potential to interact with clients and potential clients. This is why it is necessary to teach everyone throughout the firm what your brand stands for and how to convey that message. For example, are all the receptionists answering the phone in the same way? Do your attorneys and secretaries understand your verbal message or core values? Does the support staff know the firm’s story? When you bring a new attorney or staff member into the firm, put time in the orientation process to go over your law firm’s brand and messaging. Periodically refresh people on these items so that they are always at the top of everyone’s mind. 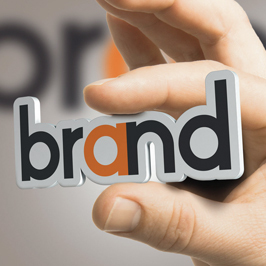 Owning and maintaining your law firm’s brand takes work. Remember, building your brand is not a sprint but a marathon that takes place over a long period of time. You have to put in the effort to ensure you and your partners are positioning your brand properly in the marketplace and that, if unauthorized use occurs, you catch it. To this end, monitor social media to ensure your internal people are following your guidelines. Check up on charity organizations you work with to confirm your logo is presented as it should be. If not, ask what happened and how to correct it for the next time. Keep your eyes open for other firms or companies that may be using similar designs in their logos or messaging that may reduce the impact of your branding efforts. If there is an act of infringement or replication, take legal steps to stop it. A lot of work goes into creating your brand, starting with the initial research about your firm and its history and its values, along with gathering perspectives on the firm’s reputation. A brand is a promise to your clients as well as your staff. That is all the more reason to own and protect your brand. If you have questions or need assistance in your branding or re-branding efforts, reach out to me, Alan E. Singles, at asingles@jaffepr.com.